Everest Chola pass trek also called Everest circuit Trekking is one of the popular and challenging Trek which leads to the specific trek to the residence of the legendary Sherpa, at the foothill of the highest top of the world, the Mt. Everest (8848m). This trek is Nepal’s most adventures treks to the Khumbu Mountains. You may be inquisitive about the ethnic community of Sherpa’s in this region. This trek takes you to Gokyo. You will be astounded by the panoramic view of many exceptional mountains that are above 8000 meters together with Lhotse, Cho Oyo, Makalu, and Gokyo. This particular trek gives you eyeful views of mountain vistas and glaciers and follows the rather praised trekking direction through the Dudh Koshi to its source the Gokyo Lake which is to the west of the Everest Base Camp. 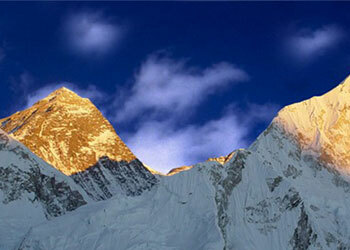 The trek gives you sufficient possibility to enjoy the notable view of Mt. Everest including numerous other comparable peaks. You could moreover discover the Buddhists monasteries and shrines along with remarkable flora and fauna. This super trek gives you the revel in of the breathtaking earth’s tallest peak “Mt. Everest”. The journey begins with an interesting Himalayan flight to Tensing Hillary airport at Lukla from Kathmandu. Everest path begins on the upper Phakding and follows the Dudh Koshi valley shifting in the direction of the agreement of Sherpa’s “the bustling Namche Bazaar” in which we can be surrounded by means of lovely Himalaya’s view. While trekking, the view of the village vicinity such as the superb forest of Rhododendron, Magnolia, and massive fir will amaze you. This trek will take you around the thrilling Gokyo Valley that is positioned adjoining to the Khumbu in conjunction with diverse Everest Base Camp. During the manner you may view the glorious glimpse of highest peaks, from west to east as Cho you (8153m), Gyanchung Kang (7922m), Everest (8848m), Lhotse (8501m) and Makalu. During the Cho La Pass trek, the hike across Cho LA Pass (5420m), which covers both the Gokyo Lake and the Everest base camp area (EBC) is eventually challenging. There may be a few briefs and an exciting ascent of Gokyo RI, Chukkung RI and Kalapathar with the view of Mt. Everest, Mt. Lhotse, Mt. Makalu, Mt. Cho you other Khumbu mountain range. One of the highlights of that is the conventional view of icefall and glacier of Mahalangur Himalayan range. You may be overwhelmed with the distinct shapes of Glaciers and the cracking sound of that glacier will blow your mind and soul. You’ll be able to view the world’s largest glacier “Ngozumpa” too. On the way, the Himalayan uncommon species along with Wild Musk, Panda, Snow Leopard, Mountain Goat “Jharal”, colorful “Pheasants” national bird of Nepal may be considered. Pine and juniper forests are the commonplace forests right here. The colorful rhododendron and magnolia floral welcome you throughout the spring in order to upload the splendor in the path. The monasteries may be observed in most of the villages in order to wake up your religious soul. The fluttering flags and Chorten may be seen anywhere. This trek is an amazingly enjoyable trek and very good for physic in addition to morals too. Drawing close the best and maximum spectacular summit on this planet and coming across of brilliant Gokyo lakes in addition to maximum altitude point of view is the greatest achievements of this trek. The unforgettable happiness is watching for your adventure Chola pass trek adventure. We will meet you at Kathmandu Tribhuvan International Airport and transfer to your hotel. Where you will have your time to settle in and freshen up after your long flight, you will be invited to visit our office for a briefing about your program. You will have meeting with your trekking guide and discuss about the equipment needed for the trekking and we will process for the trekking permits. If you arrive at night we will have same discussion in next day morning after your breakfast. Day 03: - Flight from KTM to Lukla (35 minute flight Distance 136.17km) trekking to Phakding (2652m/8701ft) walking hours: 3 hours, Distance 8 km. Day 04: - Phakding trekking to Namche Bazzar (3440m/11286ft) walking hours: 5-6 hours, Distance 11.3km. Day 06: - Namche Bazzar trek to Tengboche (3867m/12687ft) walking hours: 5 hours, Distance 10.4km. Day 09: - Dingboche Trekking to Lobuche (4940m/16207ft)walking hours: 5 hours, Distance 9km. Day 10: - Lobuche to Gorakshep (5170m/16962ft), trekking to Everest Base camp (5364m/17598ft) back to Gorak shep: walking hours: 7-8 hours, Distance 11.4km. Day 11: - Gorak Shep trekking Kala Patthar (5545m/18192ft) and back to Lobuche (4940m/16207ft) walking hours: 5-6 hours, Distance 8km. Day 12: - Lobuche to Dzongla (4830m/15846ft) walking hours: 2-3 hours, Distance 4 km. 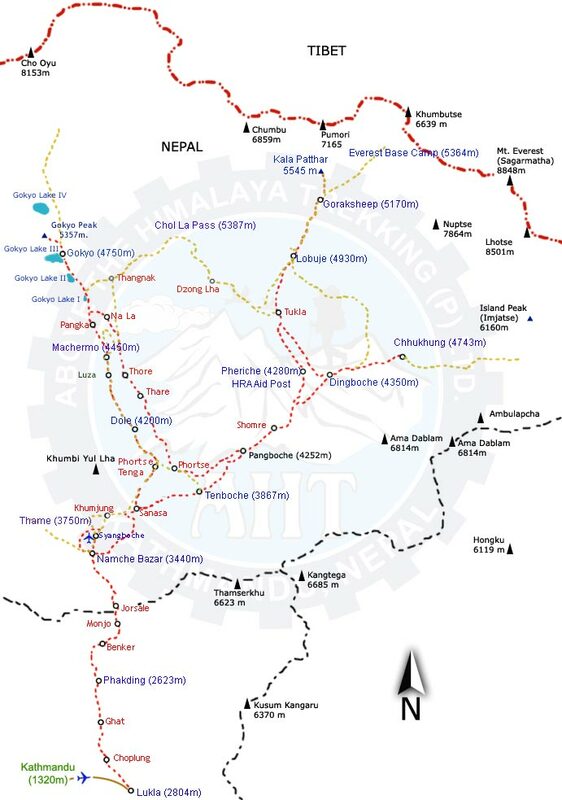 Day 14: - Thangnak trekking to Gokyo Lake walking hours: 4 hours, Distance 8km. Day 17: - Namche Bazaar trekking back to Lukla (2850m/9350ft) walking hours: 7 hours, Distance 19.4 km. Day 18: - Flight from Lukla to Kathmandu.